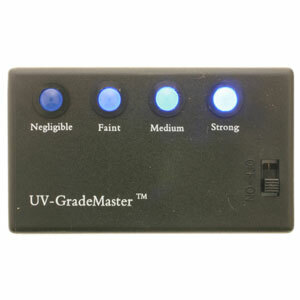 The UV-GradeMaster is a compact and efficient tool to use as your standard for grading UV reaction in the gem laboratory and also a great way for a retailer or appraiser to demonstrate what is meant by the effect of UV fluorescence in diamonds and in other gem materials. It is for grading and comparison. It does not produce any potentially harmful UV light. This unit does not fluoresce itself and can be used inside a black light box right next to a diamond that you are grading for a UV reaction. It measures about 2.38″ x 1.25″ x 0.6″ and runs on two AAA batteries which are INCLUDED. Any user with a small screwdriver can readily adjust the levels of light to suit their own UV fluorescent strength standards. Since no well defined standards exist from one major lab to the next, we are left on our own to begin to set these standards in ways that make sense. 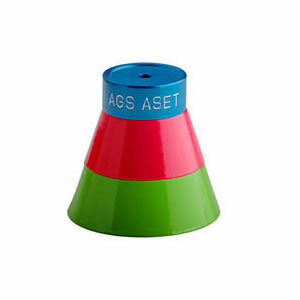 This tool will provide in-house consistency of grading. David Atlas personally pre-sets each one of these tools before delivery to you. It will arrive ready to use. Over time, you may wish to adjust or change the settings to fit your own requirements. There are small adjusters on the back which can be accessed to do this.